Wouldn’t you know it? I got my new camera and then I had a string of failures in the kitchen. They were tasty failures, but they were definitely not blog-worthy or even worthy of photographing with my new camera. I bought the brand new Junior MasterChef Australia at Target for $16 and was looking forward to making some of the recipes. Within the first week of owning the book, I had made 5 of the recipes, and I was disappointed with each one. I couldn’t understand what the problem was; I do know how to follow a recipe, and I’m not a novice in the kitchen. Well, I put the book back on the shelf and I’m not sure I’ll be following another recipe from it anytime soon. No sooner had I put that book away than the new April issue of delicious. magazine hit the shelves. Oh, delicious., you certainly know how to make me swoon! And they know how to deliver a recipe that works. A little bit hesitantly, due to my recent string of failures, I took this issue of the magazine to the kitchen and made the double-chocolate cookies in the article about Mandy Valsinger, who ran The Chocolate Maven bakery in Sante Fe, New Mexico. And, of course, they turned out sinfully delicious! What is not to love about these cookies? I’ll tell you one thing I don’t like about recipes like this one, however. It’s rolling the dough into logs when there are chunks of stuff in the dough. Whether it’s peanuts or chunks of chocolate, or whatever, it is hard to cut a straight and even slice because of those chunks. Maybe it’s the fault of my knife; maybe it is too dull. That’s the only thing I didn’t like about this recipe. Not to worry though, as I was speaking to someone else about this recipe, I found out that this person didn’t roll the dough into logs; she just scooped out bits of dough, rolled them into a ball and flattened them with the palm of her hand. Apparently they turned out just fine, although they didn’t look like the picture in the magazine. 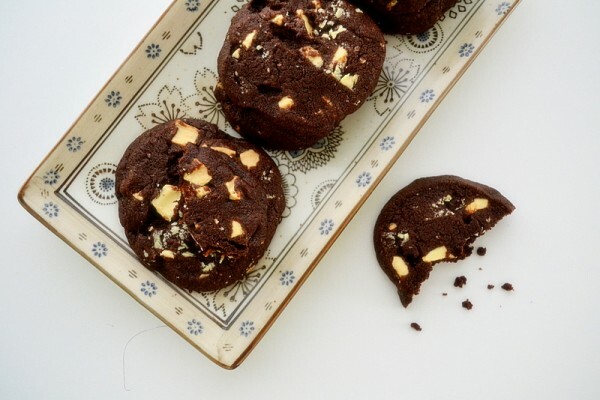 No matter which way you to decide to prepare these cookies, the most important thing is to, if possible, use the absolute best cocoa powder you can afford/find for the best chocolate taste. I use Droste cocoa powder, which I surprisingly can find at my little local fruit/grocery shop at $9 for 250g. For the white chocolate chunks, make sure you use real white chocolate – that is, read the ingredients and make sure it has at least 20-25% cocoa butter. 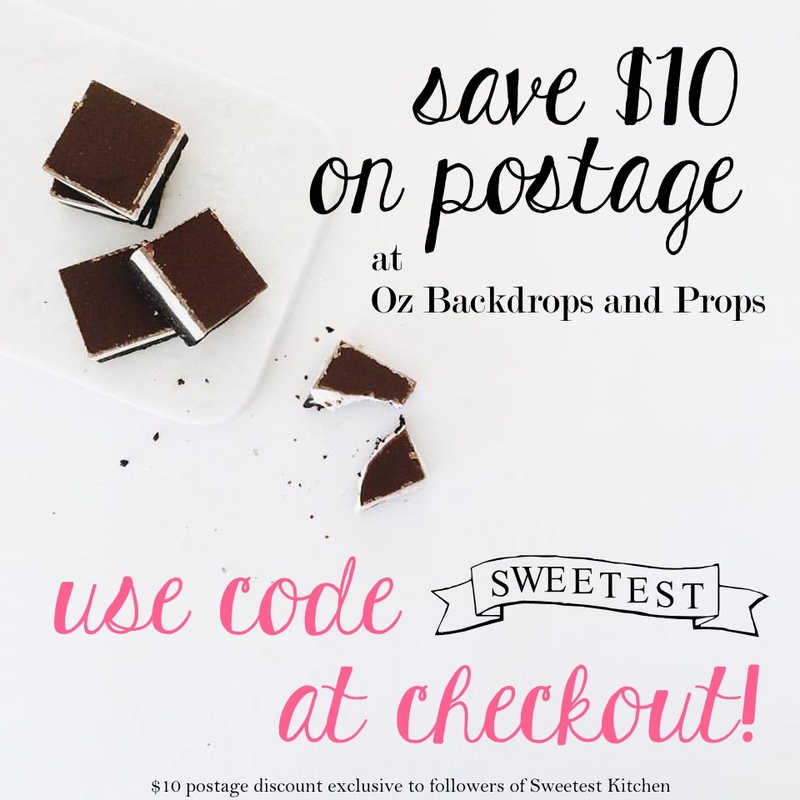 Note that you can get good results using the cheaper stuff, but if you’re trying to impress or want a decadent treat for yourself then you have to hand over the money!! I can see myself making these again in the future, no doubt about it! Next time, however, the only thing I might change is making the cookies a little smaller. The recipe says to roll the dough into a 7cm-wide log; I may do only half that diameter next time, which may mean I will need to divide the dough into 2 logs. These are so amazing! I don’t understand why you’re even still reading this – print out the recipe and make these for yourself and your loved ones now! 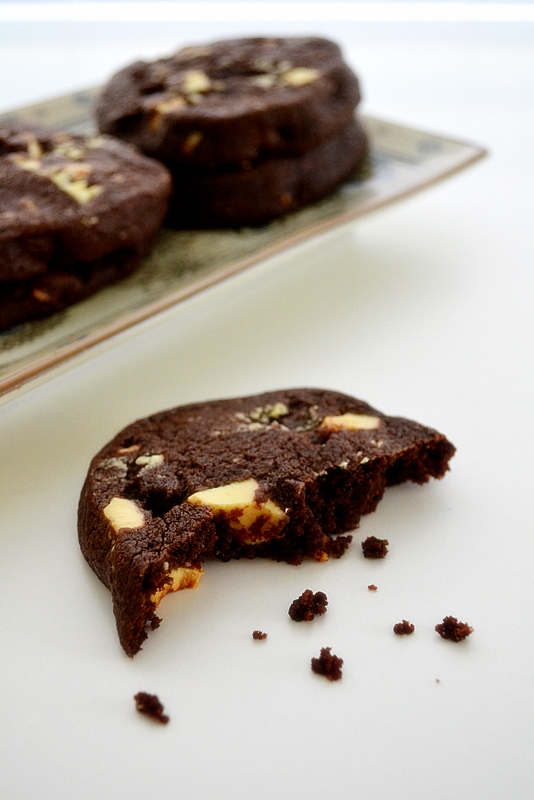 Slice and bake double chocolate cookies with heaps of dark cocoa powder and white chocolate chunks. Sift together flour, baking powder and cocoa powder in a bowl. Set aside. Place butter and sugar in the bowl of an electric mixer and beat until thick and pale, about 4 minutes. Add vanilla extract and egg, then continue to beat until just combined. Fold in the flour mixture (I used my KitchenAid on low speed to fold in the flour mixture just until the dough started sticking together), then stir through the white chocolate chunks. Form the dough into a 7cm-wide log, then enclose in plastic wrap. Place in the refrigerator to chill for at least 30 minutes (I left mine in for a bit over an hour because the dough wasn’t very firm after just 30 minutes). Unwrap the dough and slice into 1.5cm-thick rounds, using a serrated knife. Place slices on the tray, 4cm apart, and bake for 10-15 minutes until firm. Remove from the oven and cool on the tray for 5 minutes, then transfer to a wire rack to cool completely. lol! You’ll definitely need a glass of milk with these! Those cookies look like a complete success! Glass of milk and a plate of cookies right about now sounds yum! Ohh that looks so good. wow! that cookie just pops out of that photo! I just wish it would land right in my hand! Looks delish.